Stoked to be back at Beer City Crossfit where I have joined the coaching staff. Starting in September, along with coaching, I will be offering two new classes and one hour of sports massage each week. Lower body mobility series of stretches for increased hip mobility. Saturday mornings I will be holding open office hour from 8am-9am for anyone who wants to drop by for 15min max of assisted stretching or sports/Thai massage pre workout, run, bike ride or any other fun fitness activity you have planned. Saturday afternoons I will be offering Yoga for Athletes. Each class will encorporate strength, mobility, core and conditioning through a flow style series of postures and breath work. Iso-bridge to help engage the muscles in the posterior chain. October 15 I will be holding an hour and a half workshop going over some of the some of the most common low back issues associated with lifting. The class offers a series of stretch, strengthening and stabilizing exercises to help balance and support the hips and spine. Integrating wisdom and science seems like the perfect combo to make the correct choice on what fuel best serves our bodies. As an endurance athlete I have looked at my diet and health/wellness as a game of how many miles = how many pieces of French toast I got post run. While riding the continental divide this summer I was on a hidden agenda to seek out an epic cinnamon roll(Polebridge, MT) Doing a little check in with myself about how I view food and its roll in my wellness. I have decided that for the first time I'll try an elimination diet. This will not be like the diet I put myself through for a bodybuilding or physic show. I will not be measuring myself purely out of asthetics but instead I'll be recording my weight, body composition and performance to see how eating with the intention of acheiving the best me affects me after three weeks. I will be eliminating dairy, grains and legumes. Starting weight 185lbs. Twenty pounds lighter I returned home from biking coast to coast. I was also now jobless. Biking into town I noticed there was something new on my coffee route. Yellow flags reping Beer City Crossfit caught my eye as I was peddling past thinking of what my next step would be to begin training clients. One of the biggest things I gained from my cross country trip was how much community matters. As I scrolled through Beer City's website their mission statement and training philosophy really resonated with my new found hunger for helping the community through fitness. After a short meeting with Abby, one of the owners, I felt like their box would be a great opportunity to work with clients and give CrossFit a try. As a fitness/wellness professional I had avoided Crossfit due to preconceived notions that Crossfit was another fitness fad that had high risk of injury. I began joining in on the WODs that coach Jeremy programmed. I have to admit I had thought pretty highly of my fitness level until I encountered Olympic lifts such as clean and jerks, and snatches. My body had so much trouble manipulating the bar path and when it came time to attempt a ring muscle up well...it wasn't pretty. Jeremy's programming humbled me but at the same time provided a challenge in an environment where everyone there was pushing themselves at a high capacity. I loved the feeling of going all out and leaving nothing left in the tank. I worked hard and studied my weak points in efforts to catch up on skills and movements that I had previously avoided. Front squats, back, squats, tempo squats, overhead squats, cleans, snatches and maybe if we got lucky more squats. This style of training blew me away but as a trainer I saw the brilliance behind the madness. Jeremy's programming not only focused on crushing me but developing my weak points to facilitate huge gains in my power output and aerobic capacity. In 7 months I went from struggling to rep 225lbs on a back squat to squatting 350 and gaining 15lbs of lean muscle mass. My gains were more than just physical. Jeremy, Abby and Josh knew when and how to push me in a positive and encouraging way that pushed me to my limits. 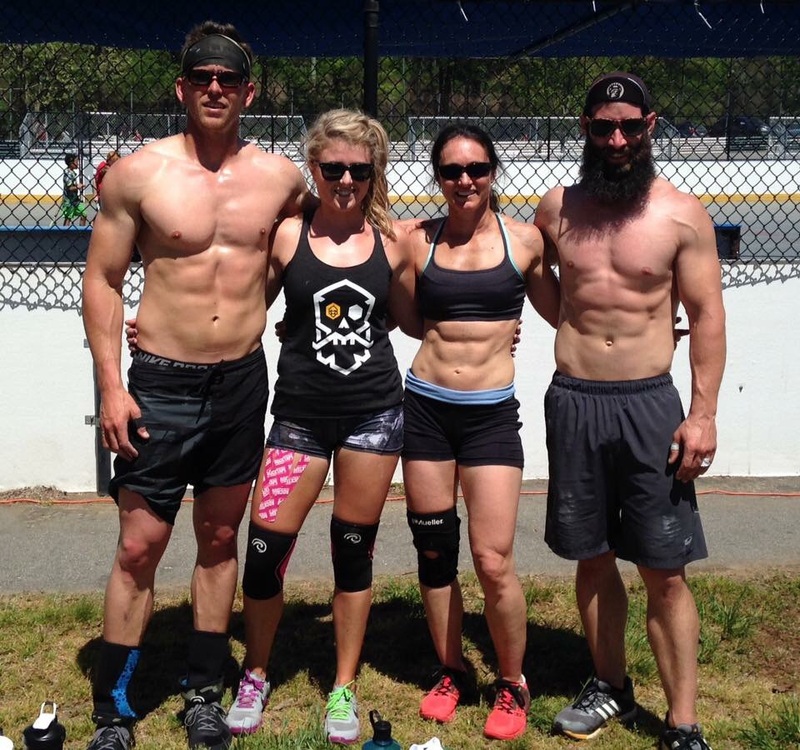 With my newfound fitness community I trained and competed in a Crossfit competition in the scaled mixed team division. We placed 3rd but I felt as though everyone who competed in the competition showed comradery I had not experienced in bodybuilding shows, bike races and running races. I'm about to take on my next big bike adventure riding the Continental Divide on my mountain bike and I know that my training at Beer City this past year has me pedaling with more power and confidence than ever before. I'll be smiling and thinking of some of Jeremy's 'spicy' WODs as I mountain bike over the Rockies knowing whatever challenge comes my way I'm ready. Much Gratitude for the Beer City fam! Mountain top! Peddle! Peddle! Peddle! TJ and a few of the the Suncrest Mobile Home Park crew hollered as I learned to ride without training wheels. There were a lot of wrecks in this process. I remember still the the feeling of fear and excitement that came with mastering the balance needed to stay upright on a bicycle. Looking back at my youth I realize how much bicycles played a role in my free time. My best bud growing up Justin Brophy likes to remind me that use to tell him how awesome my legs felt from long bike rides. Justin has admitted to me that some of our adventures by bike were a bit strenuous. Fast Forward many years that passed with biking getting replaced with skating, girls, wild parties, and bodybuilding. Six years ago while working security in a nightclub the head of security John Riffey showed up on his bike. In retrospect I now see the brilliance of John reintroducing me to bikes. This was a very dark time for me and though John might not admit it he knew I needed to peddle. I had a few incidents that put me in an all time low. John had just bought a new bike and offered to sell me his old Trek Y frame bike. I soon found myself hoping on my bike with my headphones in and pedaling for hours around Greensboro clearing my head. Next I started hitting the trails every chance I had. Realizing that It was time to retire the Y frame I got a more modern mtn bike. Mtn biking was my favorite way to get away from everything. Shredding down mountain sides hyper focused on picking the right line cutting and slicing my way back to the parking lot. I felt invincible. Life has its way of keeping me humble and in 2012 I lost my drivers license and my right to be a motorist. A wreck that could have taken my life or someone else's left me back in a dark place. This incident made it seem like I had hit bottom. I'm blessed to have good friends and family but their support wasn't enough…. I needed to peddle it out. 2013 was one of the hardest years in my adult life. I learned a lot about humility and blessings. Working full time as a personal trainer 6am-5pm then peddling across town to go to massage school from 530pm-9pm M-F. There were a lot of rainy days. Days where I would literally start to fall asleep on my ride home from school. That Fuji road bike was as old as me but I found help at the Asheville Bike Recyclery. Commuting roughly 3000 miles that year I broke almost every component on that bike but I learned a lot. I remember biking in single digit temps and thinking “poor me” and “you don't know my struggle” these thoughts would be broken when I would ride past someone who would be sleeping outside without proper gloves and cold weather attire. This made me decide to live life with less. “Why do I have 6 jackets and one body to keep warm?” I had been meditating on non-attachment to so many worldly possessions that were not serving to better my community. I moved out of my apartment and into a minivan with my bikes. This provided me with my basic needs while allowing me to plan and save for a grand adventure. 5 years after reigniting my love with bikes I decide I needed to find my way and that I couldn't do so without pedaling. The summer of 2015 I shipped my bike to City Hostel Seattle where I would begin a 5000 miles of pedaling and 200,000 feet of climbing to get home. Riding through the Rockies made me know what I would be getting into the summer of 2016. I'm 4 days out from taking on Riding the Great Divide Mountain Bike Route. My nerves are kicking in as go down my check list and look over maps. I don't know what I will encounter over the next 6 weeks but I do know that the lessons and personal growth I gained though biking has made the impossible possible. This one is for you Dad. I'll be taking you with me in my heart.